At Verity Studios, we’ve published a document outlining this emerging field. For the past 8 years, our group has designed drone systems for shows and live events. With Verity Studios, we are now creating shows and delivering turnkey products for that purpose. Verity Studios is a spinoff company of the Flying Machine Arena, at the Swiss Federal Institute of Technology (ETH Zurich). Our intent with this paper is to contribute to the emerging ecosystem of drone shows and help accelerate this industry’s safe development. The paper gives a broad overview, including creative, technical, and operational considerations. It also includes a section on best practice, which highlights the main safety concerns related to drone shows. 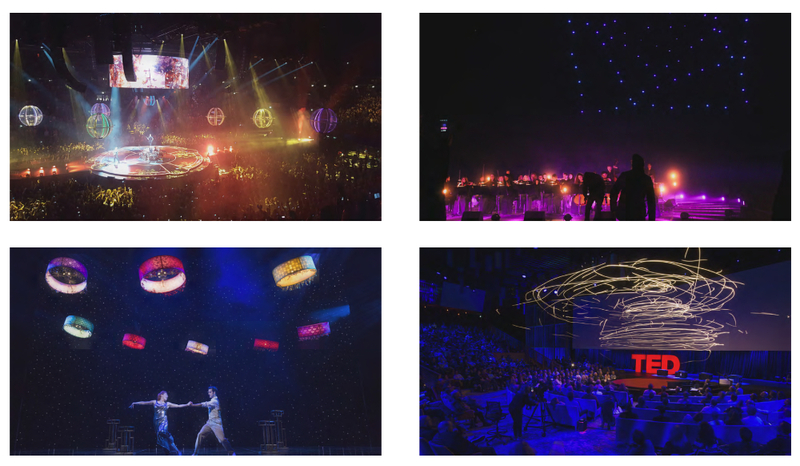 Further examples of live drone performances (starting top left): Muse Drone Tour, Ars Electronica’s Spaxels, Verity Studios’ drones in Cirque du Soleil’s Paramour on Broadway, Raffaello D’Andrea & Verity Studios’ show at TED 2016. Drone show systems are advanced show automation systems designed for live performances that enable the control of one to potentially thousands of autonomous multirotors or other small flying machines. 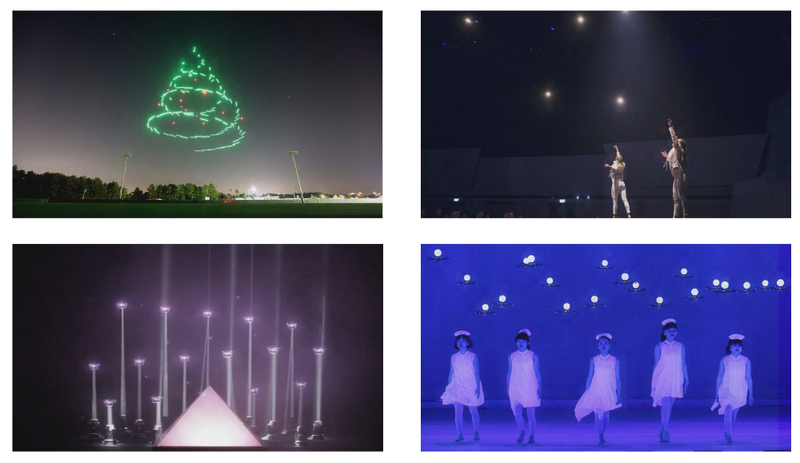 These novel systems enable the use of drones to extend the traditional palette of light, sound, stage effects, and human performers by choreographing the simultaneous movements of a multitude of flying objects in 3D space. This gives this technology the potential to fundamentally transform the live events experience. Emergent use cases for this technology include animation of flying characters, flying lighting displays, movement of stage props and scenographic elements, and the creation of flying robot actors and synthetic swarms. The key challenges for this new technology are safety and reliability. First solutions for the safe deployment of this technology exist and avant-garde creators are embracing the possibilities offered by autonomous drones. Your feedback is welcome at droneshows@veritystudios.com. 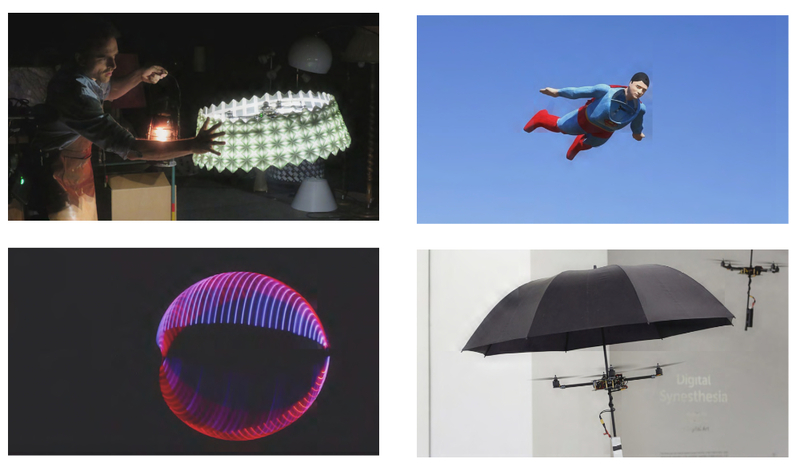 Examples of drone costumes (starting top left): Verity Studios, SPARKED; Otto Dieffenbach, Superman Drone; Ctrl.me, Performance Drones; Alan Kwan, Flying Umbrellas.